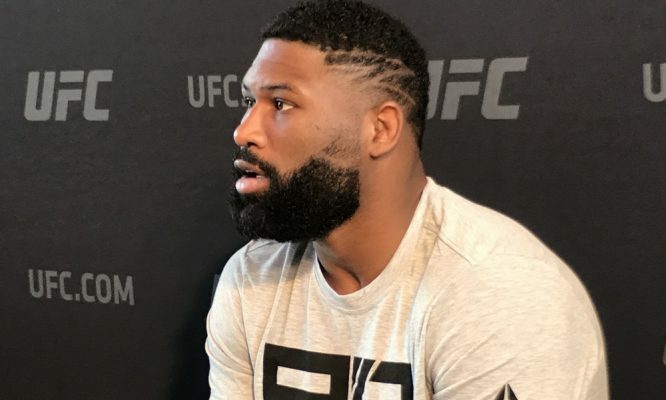 Despite rumors that the UFC would like to book a heavyweight fight between Curtis Blaydes and Alexander Volkov, it appears that matchup is definitely not on the table for September. Rumors surfaced on Tuesday that the UFC was interested in booking a heavyweight showdown between Curtis Blaydes and Alexander Volkov for the upcoming card in Moscow, Russia on Sept. 15. Despite those reports, Blaydes will not be facing Volkov or anybody else until at least November while allowing an injury tweaked at UFC 225 to heal. It was just this past weekend that Blaydes earned the biggest win of his UFC career when he flattened former title contender Alistair Overeem with a vicious third round KO to remain undefeated in his past six fights. Afterwards, Blaydes made it clear that he was only interested in one of two fights — he either wanted a heavyweight title shot or a rematch against Francis Ngannou, who is the only fighter to hold a win over him. Regardless it appeared the UFC was interested in Blaydes making a quick turn around and fighting in September but that is no longer possible after the Chicago native suffered a slight ankle and knee injury that will sideline him for the next four to eight weeks. According to Blaydes’ manager Rick Guerrero, the heavyweight contender wouldn’t be ready to return to action until at least November and he’s got his sights set on a title shot more than anything else right now. Guerrero added on Twitter that Blaydes will be a guest fighter at UFC 226 in Las Vegas on July 7 where he hopes to call out the winner of the main event fight between heavyweight champion Stipe Miocic and light heavyweight champion Daniel Cormier. Whether he gets that fight or not is unknown but it’s clear that Blaydes won’t be ready to return as early as September despite the UFC’s wishes to book him in a contender’s match in Russia.